This sounds interesting, both for the sake of curiosity and for the sake of security. 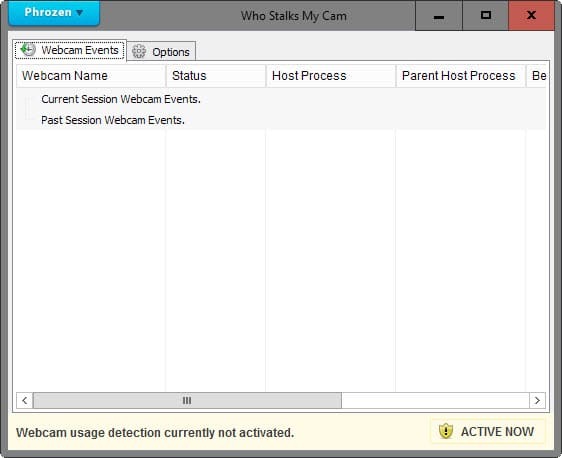 Who Stalks My Cam is a free program for the Windows operating system that detects webcam use and informs you about it. All modern laptops and smartphones ship with microphones and cameras for communication and other purposes. While those are usually initiated by the user, there is at least a chance that someone else might hack into the system and turn the web camera or microphone on to listen in or watch. As slim as a chance it may be, the prospect of someone else watching what you are doing in front of the camera or what you are saying is unpleasant, to say the least. Some users help themselves by putting tape over the camera lens (if they never use it), or by turning off the cam in the options if that is possible. Who Stalks My Cam has been designed to monitor the use of the webcam on machines running the Microsoft Windows operating system. The program has been designed to monitor the use of the webcam on the system, to inform you when it is in use, and to provide an option to disable the webcam under certain circumstances. Who Stalks My Cam is offered as a portable version or installer. The program displays information about current and past webcam events in its interface on start that provide you with a history of events. Each webcam session is listed with information such as its begin and end date, duration, the host process and parent host process, and status. Close webcam automatically when a) the process using the cam is a background process, when b) the computer is idle for a set amount of time, or c) when the process using the webcam is not whitelisted. Play a notification sound and display a notification message on activation. You may enable or disable each individually or both. The whitelist can be quite useful, as you could use it to allow only specific programs to use the webcam (e.g. a video chat program) effectively preventing all other programs from using it. A click on the Phrozen menu displays an option to test the webcam functionality of the program. All you need to do there is to select the webcam you want to test and hit the start button afterwards. If you are using a webcam connected to a Windows device regularly or at least occasionally, and want to make sure that it is only turned on when you use it, you may find Who Stalks My Cam useful for that purpose as it ensures that, especially if you are using the program’s whitelisting functionality. The post Who Stalks My Cam informs you about webcam usage appeared first on gHacks Technology News. This entry was posted on Thursday, January 21st, 2016 at 11:50 am	and is filed under software evaluation. You can follow any responses to this entry through the RSS 2.0 feed. Both comments and pings are currently closed.